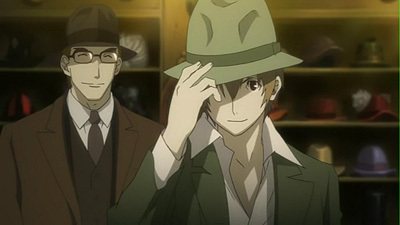 Anime-zing Funtime Blog: Anime Review: Baccano! 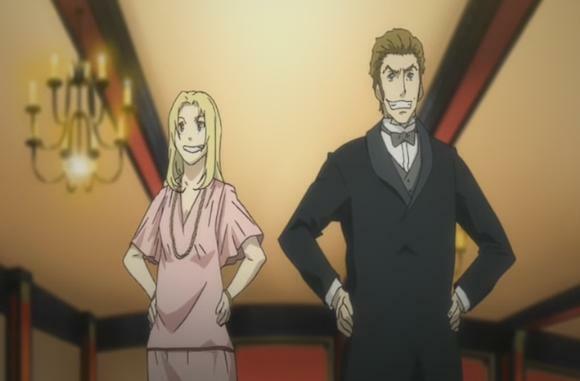 Most of the messed up cast of Baccano! This review is going to be about one of my absolute favorite anime titles of all time. I believe I may have mentioned somewhere that I sort my anime titles on my shelf by favoritism and how often I rewatch it. Baccano is near the top of that list, so yeah, I would say I like this series, but I will do my best to break it down for you. Baccano is a series that is unlike most anime titles and is actually hard to describe without divulging in too many spoilers, so I will do my best to keep the best plot twists under wraps for this review. Notice how I also linked to the Anime News Network page instead of Wikipedia or other sources. This series, much like it's cousin Durarara! are both enjoyed best without the spoilers. But this is a review, so some basic information will be needed for this to be as cohesive as possible. The series mainly takes place in 1929/1930's America, which is a bit unusual for anime, but let it sink in. The story is about a bunch of people during this time who may or may not be immortals. That's right, you heard me. Immortal. Meaning they cannot be killed by time or conventional means. The way people become immortal is to simply drink some magical elixir. Now if the series was just about that, then it wouldn't be horribly interesting. There are multiple storylines spanning across different years that are being told in the same episode. The order is: immortality elixir being produced and trading hands in America, hijacking of the trans-continental train the Flying Pussyfoot, and a girl searching for her lost brother. Alone, these tales seem to be unrelated and would probably be boring alone, but they are put together in a way that can intrigue the person who has patience. Yes, one prerequisite for watching this series is patience. You may have no idea what you are watching the first couple of episodes, but then you start to get a feel for the series and that is when the fun begins. One thing the series doesn't do is hold your hand in terms of plot and characters. You are in charge of keeping track of all of these stories and characters straight. So two characters, Isaac and Miria, appear in two of the storylines, so what? One takes place after the other, but it can be confusing to see the two of them buy costumes in one place then immediately see them on a train eating food. Thankfully, each storyline has a distinct feel and atmosphere to it that there should be no confusion when an event happens in the grand scheme of things. How about an analogy. 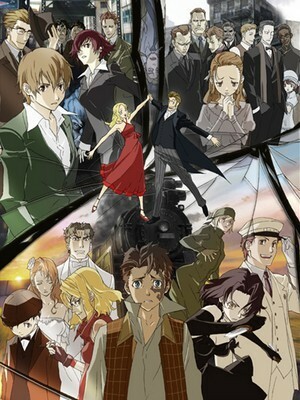 Baccano is based off of a light novel series in Japan. Imagine you have the first three books of the series. A normal person would read one book, then move on to the next, and finally the last one. Imagine someone snuck into your house one night just for the sole purpose of messing up your books. They see these three books and rip the pages out of them, mix them up, and compiles one giant book. That is what this series is. It is also a smart way of having a majority of the cast in each episode. Imagine the girl looking for her brother for 3 episodes without Isaac or Miria to break up the sad emotional tones of that story. Thankfully, you don't have to worry about that. Baccano has several things going for it. First off, there are a lot of western tropes in the series, including the aforementioned train robbery, the mob (the epic 1930's kind, like Capone) wars, a jazzy musical score, and many other things. This honestly is one my picks for a great anime to introduce to people who have never seen anime before. This series is like watching a hybrid of Lost and a gangster action flick. The series never goes into Japan nor does it rely on anyone knowing a lick of Japanese culture. Now if you were to watch this series subbed, then yes, there are Japanese voice actors, but honestly why would you do that to a newcomer? One word of caution would be the amount of graphic violence in the series. In the first episode alone you see a person get their fingers sliced off by a knife and a guy whose arm is ripped off and only has a stub of a bone sticking out, so this series is NOT recommended for kids. There are worse scenes (If I say railroad tracks, you know what I mean), and sometimes the overly bloody scenes are almost comical, but still graphic. I would say that a rating of 16+ would be appropriate for the series as a whole. Isaac and Miria. What else can you say? The characters are mostly a pass/fail cast. These are characters you will either love or hate. For instance Isaac and Miria are a couple that are arguably the innocent soul of the series, but their idiocy and hyperactive personalities will turn some viewers off. As I was showing this series to some friends, one loved the couple while the other loathed them. Pretty much the entire cast are full of personalities like this and you will learn to love and despise many of them. The series focuses on these characters and several actually go through some growth by the end of the series while others remain stagnant. As far as the story (or stories) goes, you will feel the same about them as you do about the characters. As for myself, I like the story behind the elixir in the 1930's and the train incident, but couldn't care less about the girl looking for her brother. I have a feeling this is the same for most people who have watched this series. Also, I disagree with one of the episodes as far as airing is concerned. The first episode is confusing (more time jumping than the usual episode) and actually gives away the ending to a couple main stories, so my humble recommendation is to skip the first episode until after episode 13, then watch it. Of course you will be without the obligatory introduction to characters bit, but you will learn about most of them over the course of the series. Firo and the puke-colored fedora! The animation is a mix of good and bad. In some respects, the art style takes a bit to get used to. Some of the backgrounds and animation are very detailed while some parts are not detailed at all. If you look at the photo of Isaac and Miria above, you can see some nice detail with the chandelier, but when you see the teeth of Isaac and Miria they look...um...just not detailed. That is a nice analogy for the art style of the series. Just look at the pictures in this post and you will know whether you enjoy the art style or not. One great aspect of the series is the music. Personally, I love jazz music, and this series features a ton of great jazz tracks. The opening theme has a nice energy that makes me wish I knew this song existed when I was in jazz band. The ending theme is nice, but doesn't seem to leave much of an impression on me. The background music is well done and reminds me of a well-done movie or television series. Some tracks are more jazzy, some are more orchestral, some are slightly experimental. The people involved with the music of this series should be given a lot of honor for the superb job they did with this series. I can honestly say that I think this series has the best music out of any series I have seen yet. The voice acting is done by Funimation as well as the DVD release of the series. The dub is probably the best dub I have ever listened to in an anime. The voice actors really worked on their 1930's slang and inflections (One of my favorite shoutouts was when a character used the term "speakos", short for speakeasy, a prohibition-era illegal drinking bar). Special props are deserved for J. Michael Tatum and Caitlin Glass for their work with Isaac and Miria, R. Bruce Elliot as Szillard (Seriously, I wouldn't have known that if it weren't for the entry in Anime News Network), Maxtry Whitehead as Chezlaw, Monica Rial as Chane, Todd Habercorn as Firo, and especially Sean Hennigan as Maiza. He gets special credit because in one of the flashback episodes, his character has a heavier accent than he does in the 1930's. It's subtle, but it's there and extremely well done. This is one of the series where I feel it is in the best interest to not watch the subbed version simply because of the excellent voice acting and the fact it takes place in America and hearing Americans speak Japanese is...um...weird. As far as the DVD release is concerned, Funimation added several commentary tracks which are a blast to listen to and provides some insight into the production of the scripts and acting for the show. Also included are promo shots and textless opening and closing credits. Aniplex released the series on Blu-Ray and while I appreciate them keeping the Funi dub, they didn't do as good a job with it as they could of. The title screens are not translated like they are in the Funimation release and most of the specials are gone. The series does look magnificent in high definition, though. Characters: B - Some experience growth while others are seen as either an archetype or are unnecessary in the end. Story: A- - Most of the story is good and energetic, but some storylines or points may bore you. Animation: B - Well done but sometimes seems blobbish (I think I just invented a word there!). Music: A - Outstanding soundtrack! Release (extras, editions): Funimation's release: A - Nice title cards, dubbing, extras, and commentary. Aniplex's Release: C - Title cards not translated, skimped on extras. Rewatchability: A+ - This series aspect earns the much coveted and rarely attained A+ rating from me because I have yet to find a person who has watched this series entirely who didn't want to go back and rewatch it almost immediately to understand the story better and to see clues of events from the series. Overall Grade: A - Another rarity is me giving a series an A, but Baccano deserves it and deserves to be better known in the anime world. It is a hidden gem in a sea of mediocre titles and really needs to be discovered by you. In fact, you can watch the series as of this writing on Youtube, either dubbed or subbed, so there is no excuse in not at least checking the series out. Anyone who wants to be considered an otaku has to check out this series. Seriously. It's that good. Fans of shows like Lost, Gangster Flicks, or Any Show With an Ensemble Cast. If you want to see more anime like Baccano, I suggest Durarara, Eden of the East, or Spice and Wolf.